A Louisiana National Guard helicopter assists in the oil spill area on Tuesday. Washington (CNN) -- While local officials are calling for more federal government -- specifically military -- help with the oil cleanup, only a fraction of thousands of authorized, federally funded National Guard troops have been put into service. In an exclusive interview with CNN's Larry King Thursday, President Barack Obama defended the current federal endeavor, noting that the Coast Guard, under Adm. Thad Allen, is taking the lead and is itself a part of the military. Allen, he said, will get the resources he needs. "If he says that there is equipment that's helpful for dealing with this problem, he will get it," Obama said. "What you don't want is a situation where everyone is stepping on each other and not doing the best possible job in coordination with the state and local levels." The states do have access already to many more National Guard troops than they are using. Last month, the Pentagon approved the use of up to 17,500 National Guard members to help in the Gulf of Mexico oil spill relief efforts, at the request of governors in four states. But only about 1,400 have been actively engaged. In Louisiana, 1,100 of the 6,000 authorized National Guard have been deployed. Alabama is using just 280 troops out of an authorized 3,000. Mississippi has called 70 Guard members into active duty out of an available 6,000, and Florida has only seven National Guard troops on oil-spill duty out of an authorized 2,500. A Louisiana state spokesman said that the initial mobilization of the Guard has been small, but is increasing as more containment and clean-up projects are approved. "There are different missions waiting for approval by the Coast Guard and BP," said Kyle Plotkin, spokesman for Louisiana Gov. Bobby Jindal, in an e-mail to CNN. "As those missions are approved, the National Guard would determine if additional resources in terms of Guardsmen are needed," said Plotkin. The federal government has agreed to pay for National Guard troops used in federally approved projects. State governors can activate their respective National Guard troops, using state funds. The Pentagon has granted all state assistance requests received to date, according to a Pentagon spokesman. BP, whose drilling rig caused the leak, is expected to pay the final tab. The process begins when state governors request specific missions be carried out by the National Guard. The Coast Guard's Allen, the government's point-person in charge the disaster response, reviews the request, then determines the level of resources needed, if any, for a given project. He must also determine if the task is legitimate, like building berms or flying aircraft to spread dispersant, and that it is something the National Guard are suited to do. Once Allen gives the OK, the request is sent to the National Guard Bureau to be fulfilled from the troops currently authorized by the Pentagon. Jindal has requested missions such as filling in gaps to cut off oil from bays and marshes, and is "absolutely very happy about their incredible work," Plotkin said, referring to Guard troops. 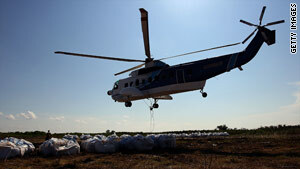 "You see the air drops ... literally 4,000 bags of sand. You see what they're doing on the ground," Jindal said during a press conference Tuesday. "This shows you it works ... this shows you the strategy will work."